East Darling harbour is one of the primary arteries of Sydney for the past 200 years, linking the city to the world. It served as the arrival point for immigrants and the arrival and departure point for tourists and export. The sweeping curve of the canal creates an island which symbolically represents the man made land in East Darling Harbour. 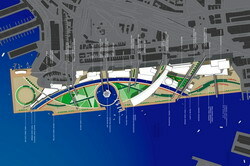 The soft landscaped park on the island sets up a dialogue between the natural and artificial lands. A variety of grass species are planted to form a weaving pattern, signifying the different people who came to settle in Sydney and are woven together by our land. Access to the island is provided by the tubular walkways, extending like the wharves from the city during the interwar years, connecting the parkland to both Hickson Road and the higher terrains of the city. These walkways weave together with a ring bridge along the canal to complete the urban fabric. The undulation and level changes of the connections and the foreshore promenade enables us to emphasise and discover fresh viewpoints of Sydney. The building line gradually descends from the south to the central axis, establishing the focal point of the site, a museum which is like the Guggenheim is to Bilbao. The built form then ascends along the curved canal, glittering and rising towards the sky, symbolising the rising spirit of mankind. Urbanvision provides services in architectural design, urban design and town planning. Our staff has rich experiences in masterplanning, site planning and the design of residential and other developments, in both large and small scale. Our expertise in both architecture and urban planning enabled us to balance between architectural and town planning issues in the design of projects, thus producing the optimal design outcome which satisfies both the requirements of our clients and the planning concerns of authorities.